Being 30 years of age, my first coherent memories of the Chicago Cubs came in 1984. While I didn't fully appreciate the team's history at the time, or understand how their playoff run that year was botched by a "Bull" and a goat, I understood the excitement I was viewing through my parent's console television. From that year on, many a summer afternoon were spent watching the Cubs, listening to Harry Caray and Steve Stone, and cheering on my favorite player, Ryne Sandberg. I've often wondered if there would ever be a day when I could watch Andre Dawson standing at the plate again, or hear another lovable rant by Harry. How fitting then, for fans of my age to now have at their disposal a Cubs DVD set that encapsulates all of the best memories we have shared with this team over the last 23 years. A&E has used their time machine to pull together eight of the defining Cubs games since 1984. While there haven't been many seasons to celebrate over the last 20 years (much less the last century), the eight full games in this package provide flashbacks to the moments that mattered most. Mark Grace's Game 1 performance against the Giants in the NL Championship of 1989 is one that many of us remember fondly. The "Sandberg Game" and Rick Sutcliffe's Game 1 dominance against the Padres give us a glimpse of the thrilling team assembled on the north side in 1984. The coaches and players that time forgot over the years are there in all their moustached and skin-tight uniformed glory. Infamous Cubs of yore such as Steve "Rainbow" Trout and Mitch "Wild Thing" Williams are on display, right beside Greg Maddux's milestone 300th career victory. The extras featured on the last DVD may be the true gems of the set. These brief nuggets in time would be nearly impossible for the common fan to ever find, even in the age of YouTube. Harry Caray's Hall of Fame induction speech and the last three postseason clinchers are treasures that never get old. But perhaps the real prizes are the highlight clips of Billy Williams and Ron Santo. These two Cub legends, along with Ernie Banks, are figures that those of our generation never had the privilege to see play in person. Diving stops by Santo at third base and mammoth home runs onto Waveland Avenue are set to the tune of Jack Brickhouse and his famous "Hey Hey!". 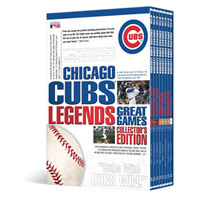 Taken together, this DVD package is something any true blue Cub fan would adore. Kudos to the folks at A&E for giving us the opportunity to view these nostalgic games and highlights. We have included a link to the DVD set at the bottom of this post, as well as in our left sidebar if you would like to check it out for yourself. In the coming weeks, I will be providing a detailed, lighthearted account of each game, as well as the bonus features. We hope you enjoy.